I’ve never thought about about how I discovered my style. My mom and I always loved shopping together and I grew up coveting clothes (for better or for worse). I was a girly girl. Courtney on the other hand was raised as a tom boy. Her parents were active and the women in her life never made style a priority. She was raised to view fashion as superficial, frivolous, and materialistic. I asked her what had changed, and she said that she now sees fashion as less of a superficial pastime and more of a means of expressing oneself–a way to feel good about yourself and present yourself in the best way. I think Courtney’s realization is a very important one. Like it or not the way you present yourself matters. People judge you on the way you look. I am not saying that you need to be supermodel gorgeous or thin, because who is? And I recognize our society as a whole tends to promote unattainable standards of beauty. But that being said, we can all take the time to dress well and present the best version of ourselves. I want to also acknowledge that fashion can be superficial, frivolous, and materialistic. But, you don’t have to buy outrageously expensive or trendy items to be put together and stylish. I acknowledge that I spend more than I should on clothes, but I also view fashion as a hobby (just like Courtney’s hobby, she spends a ton on triathlons and equipment lol). It is important to find a middle ground–a style you can afford that makes you look and feel great (read more on how to decide when to splurge and when to save here). If you want to discover your style, you have to start with the basics. 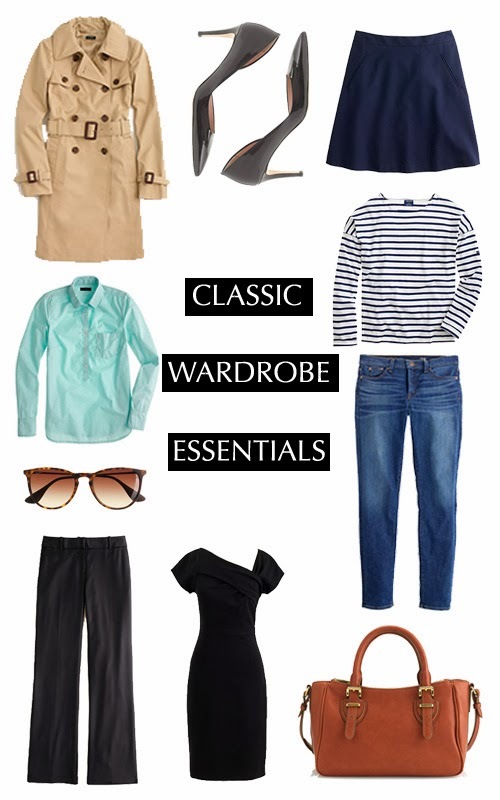 Shopping for wardrobe essentials forces you to understand what shapes flatter your figure without worrying about trends. A natural product of forcing yourself to take the time to shop for certain items, is you will begin to gravitate to styles, colors, and patterns you like. Gradually overtime you will figure out what works for you. For all of these basics, fit is the most important factor!!! Personally, I don’t think you can force a style. Finding your personal style takes time. It isn’t about emulating trends or categories of style like “preppy.” Don’t pigeonhole yourself to one trend or style! Wear what you like (you will have some misses, no one is perfect) and what flatters your figure. Be patient, trust yourself, and let your style develop. What items do you think every woman should own?